How: 1. Divide a business card into thirds vertically. 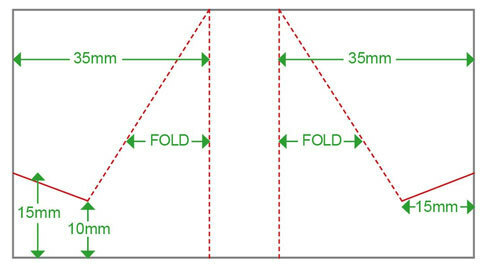 Fold the ends forward. 2. Cut it according to the diagram below. 3. Stand the card up, and rest your PSP on it to watch a movie. Have an idea for a 5-minute project? Send it to us at h20@bonniercorp.com. This works, but it is NOT a sturdy way to hold up a PSP. And if you mis-align your PSP too much to the right or left, the "feet" of the paper will fold in and rocket your PSP forward. To make this stronger, just take your waste paper and tape it onto the back of the stand to make it stronger. It actually does work. You probably should get out a ruler and have a couple cards on hand when you try it though. I don't think it's that inteesting but it works! This article is fabulous, I really enjoyed reading it. I like the way you expose your ideas and how you try to make them all look easy. In short, one of the greatest post I have read in my entire life.